At a small, rustic golf course near Brevard, the animals get your attention (and carry your bags), but the memories keep golfers, and their kids, coming back for more. Not much has changed at the Sherwood Forest Golf Club since I first played there in 1972, except that they have caddies now. 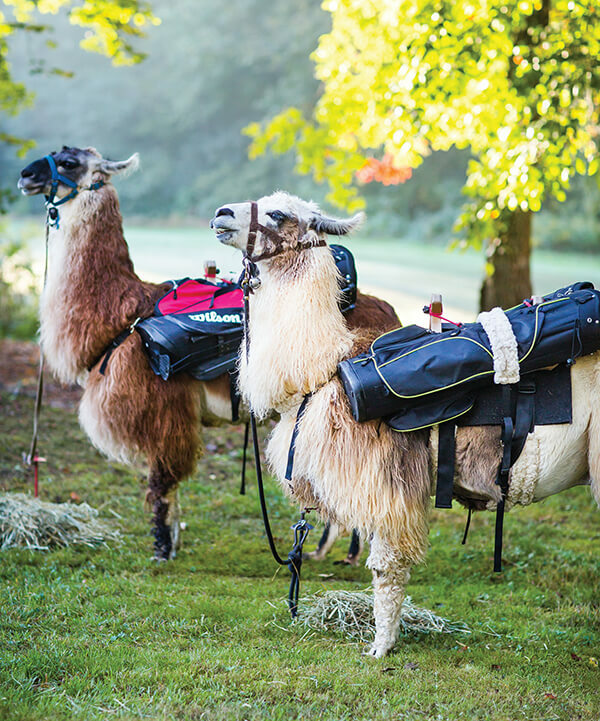 And the caddies are llamas. 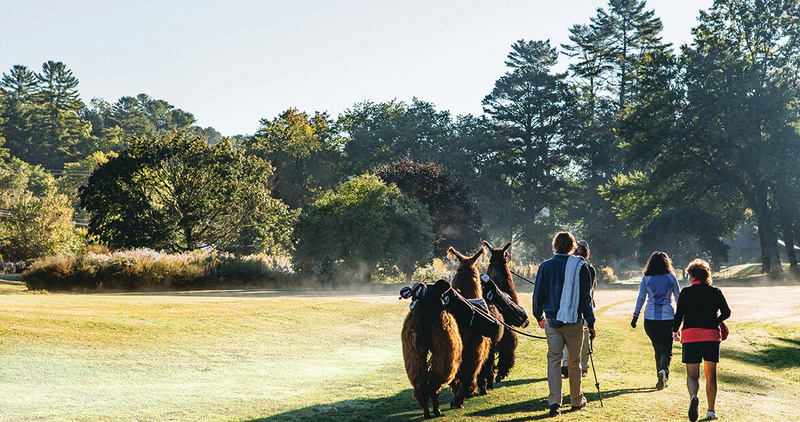 Sherwood club pro Brian Lautenschlager thought English was nuttier than Sam-I-Am, but he allowed him to bring his five llamas to the course for caddie training. Soon, cars were pulling over on U.S. Route 276 for photo ops, llama caddies were drawing their own galleries, and local TV reporters were swooning. Lautenschlager had arrived in 2008, when Sherwood was struggling. He not only helped turn the little course around, but also became that rare golf pro who interrupts lessons to chase rogue llamas across the practice green. And English? He became the latest golfer to use Sherwood Forest to reconnect with his childhood. • • •Long before the llamas arrived, my grandfather W.W. Ward (a k a W.W.W.) and his wife, Ginny, settled a piece of land in the Blue Ridge Mountains just south of Brevard. They called it Slick Rock Mountain and built a cabin on top, and every summer when I was a kid, my family piled into a wood-paneled station wagon to travel the 13 hours from our home in Connecticut to paradise. One afternoon when I was 8 years old, W.W.W. drove me down the mountain and hung a left onto Route 276. A mile up the road, a golf course appeared on the passenger side. He told me it was a par-3 course. I nodded cluelessly. Eight-year-old me had never given golf the slightest thought. At Sherwood’s first tee, W.W.W. handed me a club with a 9 etched into it. I teed up a ball and took a mighty swing. Whiff. I hacked again and again and again until finally the ball clanked off the back of the clubhead and worm-burned its way to the ladies’ tee. W.W.W. tossed me another ball, explained the concept of a mulligan, and told me to step around to the other side of the ball this time. I had been swinging lefty, as I did in Little League baseball, but my grandfather informed me that I would be a righty golfer, avoiding a lifetime of nuisance pursuing hard-to-find southpaw clubs. W.W.W. didn’t play with me. He drove the cart. Offered swing tips. Chuckled whenever I duckhooked a tee shot halfway to South Carolina and then helicoptered my driver closer to the hole than my ball. He never scolded me, just observed with a Pall Mall hanging from his amused lips. The madder I got, the louder he laughed, until it dawned on me how ridiculous I looked. To this day, I still hear his laughter whenever I’m tempted to till a green after a lip-out. For each of the next 10 summers, W.W.W. took me to Sherwood. Most of the highlights of my golf career have occurred there: my first par, my first birdie, my first stoppedcounting, my first don’twannatalkaboutit, my first shutupanddrive, and hopefully my first hole in one. Someday. • • •I’ve been blessed to play the Old Course at St. Andrews, the Ocean Course at Kiawah Island, Bethpage Black, and Pinehurst No. 2. None of them stir my golfing soul quite like Sherwood, because it is so disarmingly casual. The “clubhouse” has a creaky screen door. Greens run about four on the Stimpmeter. Distance markers appear to be guesses. There is no dress code. Groups of five, six, and 11 are routinely overlooked, and some diehards have been known to play as many as 90 holes at Sherwood’s all-day weekday rate of $25. I hate to suggest that play can be slow, but there is a gazebo beside the fifth tee. Still, people come back, across decades and generations. Allan Buckreus, 95, is a member who plays three times a week with 88-year-old Jay Byrd. For 20 years straight, a pack of golf bros have played Sherwood as their nostalgic warm-up round on an annual fall golf trip. Four generations of one family have been known to play in the same foursome. Our round featured my wife shanking an approach shot through Vision’s legs on No. 2, and an impromptu llama race up the 10th fairway during which Lightning belied his name. Walking off the 18th green, the entire family pointed to the sky, my traditional tribute to the man who sparked my lifelong golf passion with a backward 9-iron. As we approached the sign for a llama crossing, my son asked if we could play Sherwood again soon. Crothers is a former senior writer at Sports Illustrated who is currently a journalism professor at the University of North Carolina at Chapel Hill and freelance sports writer. He is the author of The Man Watching, a biography of Anson Dorrance, the legendary coach of the UNC women’s soccer team.